At Canada Vein Clinics, we strive to bring our patients the latest and most effective vein care treatments with lasting effects, and minimal to no downtime for recovery. Varicose veins are one of the most uncomfortable venous conditions for many of our patients. Previously, the method of treatment for varicose veins was a vein stripping surgery that required the extraction of the from the body. Fortunately, there now exists a minimally invasive treatment that is non-surgical, requires no laser treatment and is virtually painless with no tumescent anesthesia required. ClariVein treatment, or non-thermal vein ablation, is a non-heat-dependent procedure providing a major advantage over EVLT, as it removes the possibility of any collateral nerve damage. ClariVein treatment is the most effective varicose vein treatment offered at Canada Vein Clinics. Varicose veins are unsightly, bulging and lumpy veins located just beneath the surface of the skin. Varicose veins cause discomfort in the legs, as the calves contain a major vein that pulls blood from the bottom trunk of the body back up to the heart. With varicose veins, as the leg veins pull blood upward against gravity, the valves that ensure no backflow of blood become weakened. The weakening of the valves in the legs may develop due to genetic predispositions, or can happen with age or other stresses on the legs such as weight gain. The walls of veins and valves become weak with extra pressures from excess weight and the constant position of sitting or standing. When the walls of the veins are weakened the valves are more prone to leaking, and blood flow to the superficial veins increases. The increase in blood flow to these veins creates the condition of varicose veins. These varicose veins can grow into very large and painful surface veins. Varicose veins can cause pain in everyday activities such as walking, sitting and bending. ClariVein treatment will help to close these veins for good, without uncomfortable surgeries or weeks of recovery time. ClariVein is an effective treatment for clearing your legs of often painful and debilitating varicose veins. This treatment is an outpatient procedure that requires no anesthetic and no incisions to complete. 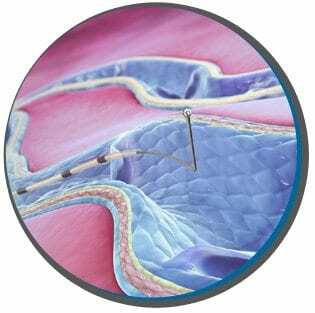 The treatment is performed by the insertion of a small, temporary rotating wire catheter directly into the vein. This catheter administers medication to close the vein. The ClariVein treatment requires no anesthetic at any point during the process. To begin placing the rotating wire catheter, your physician will insert the tiny, wired tip into the entry point of the vein directly through the skin. The catheter is then temporarily inserted into the affected vein. Once the tip is in place, the physician will begin rotating the wire in a 360-degree spinning motion. This rotation allows the tip to administer medication effectively to the walls of the vein. 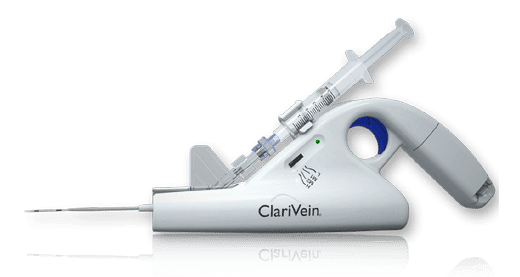 Why should I consider ClariVein? ClariVein is the best non-surgical procedure for treating varicose veins. Because this treatment is minimally invasive, there is no recovery time. Patients can often resume normal activity and return to work immediately following the procedure. There is no patient preparation required for this treatment. Many of our patients at Canada Vein Clinics come to us with concerns about their varicose veins and all of the possible issues that come with them. We understand that many people are unaware of the treatment options, or that treatment options even exist. At Canada Vein Clinics, we treat all of your venous conditions in a caring, personal, and supportive manner. Treatment for varicose veins and all the inconveniences and pain that often accompany them are just a phone call away. Our state of the art ClariVein treatment is quick and painless, with fantastic results. The procedure generally takes only half-an-hour, so why wait? Call us at Canada Vein Clinics today. Let’s explore all of your questions.